This is a nice, clean 1920's era ratchet spiral screwdriver! It is marked "NORTH BROS. MFG. CO. YANKEE NO. 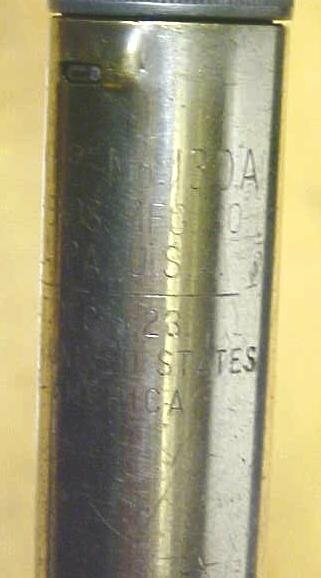 130A PHILA PA. PAT'D DEC. 11 23 MADE IN THE UNITED STATES OF AMERICA", on the main nickel plated shaft. The nickel plating is about 85% intact, look nice. This screwdriver is the mid-size that Stanley made in regards to tooling, or the tips that fit into the chuck, they are the .280 (9/32") shank diameter size. The chuck holds a variety of different slot Phillips type screwdriver tips, that we usually have in stock as an option. There is two different sized slot bit included with this screwdriver. There is little wear noted on the screwdriver, a few scratches and minor dings, on the maroon painted hardwood handle, including the original "YANKEE" impression on the handle, the paint on the handle is about 85% intact. In very good mechanical condition also, works smoothly. Remember to add a few drops of oil from time to time as these antique screwdrivers require lubrication on the spiral shaft. This one has a rapid return spring, on the spiral system, so it springs back after you push it in to drive/loosen a screw. We generally have hex head bit adapters and other tips, including drill adapters, in stock for this size screwdriver if you wanted to use it like a push drill as well. A nice one! Items Similar To "North Bros. Yankee Spiral Ratchet Screwdriver No. 130A"